Please enjoy free PDF versions of the following books for children in grades K - 9. The "How I Became A Scientist Activity Book" for third graders highlights eight scientists from all over the world who work with animals. These scientists work hard to make sure that people and their animals stay healthy. 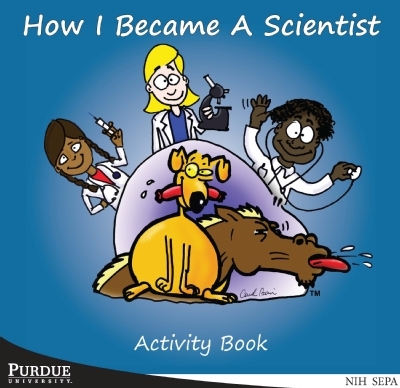 Activities in the book cover topics related to each scientist's area of study. "How I Became a Scientist"
3.1 – Students understand the basic features of words. They select letter patterns and know how to translate them into spoken language using phonics (an understanding of the different letters that make different sounds), syllables, work parts (un-, -ful), and context (the meaning of the text around a word). They apply this knowledge to achieve fluent (smooth and clear) oral and silent reading. 3.1.5 – Demonstrate knowledge of grade-level-appropriate words to speak specifically about different issues. 3.2 – Students read and understand grade-level-appropriate material. At Grade 3, in addition to regular classroom reading, students read a varity of nonfiction, such as biographies, books in many subject areas, children's magazines and periodicals, and reference and technical materials. 3.2.2 – Analysis of Grade-Level-Appropriate Nonfiction and Informational Text: Ask questions and support answers by connecting prior knowledge with literal information from the text. 3.4 – Students find and discuss ideas for writing and keep a list of writing ideas. Students write clear sentences and paragraphs that develop a central idea. Students progress through the stages of the writing process, including prewriting, drafting, revising, and editing multiple drafts. 3.4.4 – Research Process and Technology: Use various reference materials (such as a dictionary, thesaurus, atlas, encyclopedia, and online resources). 3.5 – At Grade 3, students continue to write compositions that describe and explain familiar objects, events, and experiences. Students write both informal and formal letters. Student writing demonstrates a command of Standard English and the drafting, research, and organizational strategies outlined in Standard 4 – Writing Processes and Features. Writing demonstrates an awareness of the audience (intended reader) and purpose for writing. 3.6 – Students write using Standard English conventions appropriate to this grade level. 3.6.2 – Sentence Structure: Write correctly complete sentences of statement, command, question, or exclamation with final punctuation. Imperative: Please take your seats. Interrogative: Are we there yet? 3.1 – Students understand the relationships among numbers, quantities, and place value in whole numbers up to 1,000. They understand the relationships among whole numbers, simple fractions, and decimals. 3.2 – Students solve problems involving addition and subtraction of whole numbers. They model and solve simple problems involving multiplication and division. 3.4 – Students describe and compare the attributes of plane and solid geometric shapes and use their understanding to show relationships and solve problems. 3.4.1 – Identify quadrilaterals as four-sided shapes. 3.6 – Students make decisions about how to approach problems and communicate their ideas. 3.6.2 –Decide when and how to break a problem into smaller parts. 3.4 – Students learn about an increasing variety of organisms. They use appropriate tools and identify similarities and differences among them. Students explore how organisms satisfy their needs in typical environments. 3.4.6 – Explain that people need water, food, air, waste removal, and a particular range of temperatures, just as other animals do. 3.4.7 – Explain that eating a variety of healthful foods and getting enough exercise and rest help people to stay healthy. 3.4.8 – Explain that some things people take into their bodies from the environment can hurt them and give examples of such things. 3.5.5 – Explain that one way to make sense of something is to think of how it relates to something more familiar. 3.2 – Students will explain what it means to be citizens of their community, state, and nation; be able to identify the functions and major services provided by local governments; use a variety of resources to gather information about local, state, and national governments; and demonstrate understanding of democratic principles and practices. 3.2.5 – Roles of Citizens: Explain the importance of being a good citizen of the state and the nation. Identify people in the state who exhibit the characteristics of good citizenship. 3.3 – Students will explain that simple grid systems (latitude and longitude) are used to locate places on maps and globes, and will begin to understand the Earth/sun relationship, identify the distinctive physical and cultural features of their community, and explain the geographic relationships within their own community with the state and other states within the region. This project was supported by the National Center for Research Resources and the Division of Program Coordination, Planning, and Strategic Initiatives of the National Institutes of Health through Grant Number R25 OD011115-04. Veterinarians have fun and exciting jobs! 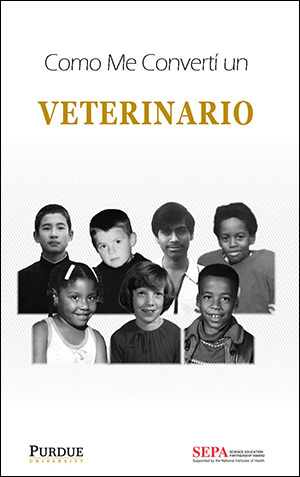 In this book you will meet veterinarians from all over the world. These veterinarians work hard to make sure people and their animals stay healthy. Maybe one day you will become a veterinarian too! "How I Became a Veterinarian"
SCI.2.3.2 2010 - Compare and contrast details of body plans and structures within the life cycles of plants and animals. SCI.4.3.2 2010 - Observe, compare and record the physical characteristics of living plants or animals from widely different environments. Describe how each plant or animal is adapted to its environment. SCI.4.3.4 2010 - Describe a way that a given plant or animal might adapt to a change arising from a human or non-human impact on its environment. SS.2.1.3 2007 - Identify individuals who had a positive impact on the local community. SS.2.2.4 2007 - Roles of Citizens: Describe how people of different ages, cultural backgrounds and traditions contribute to the community and how all citizens can respect these differences. SS.2.2.5 2007 - Roles of Citizens: Identify people who are good citizens and describe the character traits that make them admirable. SS.3.2.5 2007 - Roles of Citizens: Explain the importance of being a good citizen of the state and the nation. Identify people in the state who exhibit the characteristics of good citizenship. SS.3.3.9 2007 - Human Systems: Identify factors that make the region unique, including cultural diversity, industry, the arts and architecture. SS.3.4.2 2007 - Give examples of goods and services provided by local business and industry. SS.3.4.4 2007 - Define interdependence and give examples of how people in the local community depend on each other for goods and services. RI.2.1 - Ask and answer such questions as who, what, where, when, why, and how to demonstrate understanding of key details in a text. RI.2.2 - Identify the main topic of a multiparagraph text as well as the focus of specific paragraphs within the text. RI.2.4 - Determine the meaning of words and phrases in a text relevant to a grade 2 topic or subject area. RI.2.5 - Know and use various text features (e.g., captions, bold print, subheadings, glossaries, indexes, electronic menus, icons) to locate key facts or information in a text efficiently. RI.2.6 - Identify the main purpose of a text, including what the author wants to answer, explain, or describe. RI.3.7 - Use information gained from illustrations (e.g., maps, photographs) and the words in a text to demonstrate understanding of the text (e.g., where, when, why, and how key events occur). RI.4.1 - Refer to details and examples in a text when explaining what the text says explicitly and when drawing inferences from the text. RI.4.2 - Determine the main idea of a text and explain how it is supported by key details; summarize the text. RI.4.4 - Determine the meaning of general academic and domain-specific words or phrases in a text relevant to a grade 4 topic or subject area. RI.4.5 - Describe the overall structure (e.g., chronology, comparison, cause/effect, problem/solution) of events, ideas, concepts, or information in a text or part of a text. RI.4.7 - Interpret information presented visually, orally, or quantitatively (e.g., in charts, graphs, diagrams, time lines, animations, or interactive elements on Web pages) and explain how the information contributes to an understanding of the text in which it appears. 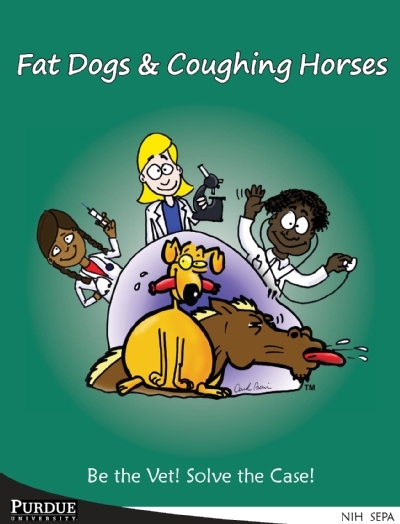 Fat Dogs & Coughing Horses: Be the Vet! Solve the Case! 6.2 Students read and understand grade-level-appropriate material. At Grade 6, in addition to regular classroom reading, students read a variety of nonfiction, such as biographies, autobiographies, books in many different subject areas, magazines, newspapers, reference and technical materials, and online information. 6.2 Students solve problems involving addition, subtraction, multiplication, and division of integers. They solve problems involving fractions, decimals, ratios, proportions, and percentages. 6.6 Students compute and analyze statistical measures for data sets. They determine theoretical and experimental probabilities and use them to make predictions about events. 6.6.6 Understand and represent probabilities as ratios, measures of relative frequency, decimals between 0 and 1, and percentages between 0 and 100 and verify that the probabilities computed are reasonable. 6.7 Students make decisions about how to approach problems and communicate their ideas. 6.7.1 Analyze problems by identifying relationships, telling relevant from irrelevant information, identifying missing information, sequencing and prioritizing information, and observing patterns. 6.7.9 Make precise calculations and check the validity of the results in the context of the problem. 6.7.10 Decide whether a solution is reasonable in the context of the original situation. 6.3 Describe that all organisms, including humans, are part of complex systems found in all biomes (i.e., freshwater, marine, forest, desert, grassland and tundra). 6.3.5 Describe how all animals, including humans, meet their energy needs by consuming other organisms, breaking down their structures, and using the materials to grow and function. 6.3.6 Recognize that food provides the energy for the work that cells do and is a source of the molecular building blocks that can be incorporated into a cells structure or stored for later use. HEALTH & WELLNESS: Students will comprehend concepts related to health promotion and disease prevention to enhance health. 6.1 The acquisition of basic health concepts and functional health knowledge provides a foundation for promotion health-enhancing behaviors among youth. This standard includes essential concepts that are based on established health behavior theories and models. Students apply knowledge of personal responsibility for health promotion and/or risk reduction. They describe patterns of healthy behaviors to prevent or reduce their risk of injury and/or illness throughout their lifespan. Students examine the interrelationships of emotional, physical, social and intellectual health and how they can be impacted by their surroundings. 6.1.1 Compare how healthy behaviors and personal health are linked. 6.1.7 Identify the benefits of practicing healthy behaviors. HEALTH & WELLNESS: Students will demonstrate the ability to practice health-enhancing behaviors and avoid or reduce health risks. 6.7 Research confirms that practicing health-enhancing behaviors can contribute to a positive quality of life. In addition, many diseases and injuries can be prevented by reducing harmful and risk taking behaviors. This standard promotes accepting personal responsibility for health and encourages the practice of healthy behaviors. Students demonstrate health-enhancing behaviors to prevent injuries, diseases and disorders. 6.7.1 Identify the importance of being responsible for health behaviors. 6.7.2 Indicate healthy behaviors that will maintain or improve the health of self and others. 6.7.3 Decide when and how to break a problem into simpler parts. 6.7.5 Express solutions clearly and logically by using the appropriate mathematical terms and notation. Support solutions with evidence in both verbal and symbolic work. HEALTH & WELLNESS: Students will demonstrate the ability to access valid information and products and services to enhance health. 6.3 Accessing valid health information and health-promoting products and services is critical in the prevention, early detection and treatment of health problems. This standard focuses on how to identify and access valid health resources and to reject unproven sources. Applying the skills of analysis, comparison and evaluation of health resources empowers students to achieve health literacy. Students identify valid health information, health-promoting products, and services to prevent and detect health problems. 6.3.1 Indicate the validity of health products. HEALTH & WELLNESS: Students will demonstrate the ability to use decision-making skills to enhance health. 6.5 Decision-making skills are needed in order to identify, implement and sustain health-enhancing behaviors. This standard includes the essential steps needed to make healthy decisions as prescribed in the performance indicators. Students identify a decision-making process which enables them to collaborate with others to improve quality of life now and in the future. 6.5.1 Name conditions that can help or hinder healthy decision making. 6.5.2 Explain when health-related situations require a thoughtful decision-making process. 6.5.4 Identify healthy and unhealthy options to health-related issues or problems. 6.5.6 Distinguish healthy options over unhealthy options when making a decision. 6.5.7 Predict the results of a health-related decision. 6.4 Students discuss and keep a list of writing ideas and use graphic organizers to plan writing. They write clear, coherent, and focused essays. Students progress through the stages of the writing process and proofread, edit, and revise writing. engage the interest of the reader. develop the topic with supporting details and precise language. 6.5 At Grade 6, students write narrative, expository (informational), persuasive, and descriptive texts (research reports of 400 to 700 words or more). Student writing demonstrates a command of Standard English and the research, organizational, and drafting strategies outlined in Standard 4 - Writing Processes and Features. Writing demonstrates an awareness of the audience (intended reader) and purpose for writing. support the position with organized and relevant evidence and effective emotional appeals. anticipate and address reader concerns and counterarguments. (Core Standard) Example: Write a persuasive essay on how the class should celebrate the end of the school year, including adequate reasons for why the class should participate in the activity described. Create an advertisement for a product to try to convince readers to buy the product. 6.6 Students write using Standard English conventions appropriate to this grade level. 6.6.2 Grammar: Identify and properly use indefinite pronouns (all, another, both, each, either, few, many, none, one, other, several, some), present perfect (have been, has been), past perfect (had been), and future perfect verb tenses (shall have been); ensure that verbs agree with compound subjects. Indefinite pronouns: Each should do his or her work. Indefinite pronouns: Many were absent today. Correct verb agreement: Todd and Amanda were chosen to star in the play. 6.6.3 Punctuation: Use colons after the salutation (greeting) in business letters (Dear Sir:), semicolons to connect main clauses (The girl went to school; her brother stayed home. ), and commas before the conjunction in compound sentences (We worked all day, but we didn't complete the project.). 6.6.4 Capitalization: Use correct capitalization. 6.6.5 Spelling: Spell correctly frequently misspelled words (their/they're/there, loose/lose/loss, choose/chose, through/threw). 6.6.6 Identify and correctly use prepositional phrases (for school or In the beginning), appositives (We played the Cougars, the team from Newport), main clauses (words that express a complete thought), and subordinate clauses (clauses attached to the main clause in a sentence). We began our canoe trip on the White River (prepositional phrase) when it stopped raining (subordinate clause). 6.1.5 List ways to reduce or prevent injuries. 6.1.6 Identify how health care can promote health. 6.3.3 List the accessibility of health-related products. 6.3.4 Recognize circumstances that may require professional health services. 6.3.5 Find valid and reliable health services. HEALTH & WELLNESS: Students will demonstrate the ability to advocate for personal, family and community health. 6.8 Advocacy skills help students promote healthy norms and healthy behaviors. This standard helps students develop important skills to target their health enhancing messages and to encourage others to adopt healthy behaviors. Students assess valid information and opinions about health issues. Students demonstrate skills to encourage others to adopt health-enhancing behaviors. 6.8.1 State a health position and support it with accurate information. 6.8.2 Show how to support others to make positive health choices. 6.8.3 Plan with others to advocate for healthy individuals. Academic Standarts Alignment for "Let's Cure Cancer"
9-10.RI.6: Determine an author's point of view or purposes in a text and analyze how an author uses rhetoric to advance that point of view or purpose. 9-10.RI.10: By the end of grade 9, read and comprehend literary nonfiction in 9-10 text complexity band proficiently, with scaffolding as needed at the high end of the range. 9-10.L.4: Determine or clarify the meaning of unknown and multiple-meaning words and phrases based on grades 9-10 reading and content, choosing flexibly from a range of strategies. 9-10.L.6: Acquire and use accurately general academic and domain-specific words and phrases, sufficient for reading, writing, speaking, and listening at the college and career readiness level; demonstrate independence in gathering vocabulary knowledge when considering a word or phrase important to comprehension or expression. 9-10.RS.4 Determine the meaning of symbols, key terms, and other domain-specific words and phrases as they are used in a specific scientific context relevant to grades 9-10 texts and topics. 9-10.RS.8 Assess the extent to which the reasoning and evidence in a text support the author's claim or a recommendation for solving a scientific problem. S-CP.5 Recognize and explain the concepts of conditional probability and independence in everyday language and everyday situations. For example, compare the change of having lung cancer if you are a smoker with the chance of being a smoker if you have lung cancer. SCI.B.1.3 Explain and give examples of how the function and differentiation of cells is influenced by their external environment (e.g., temperature, acidity and the concentration of certain molecules) and changes in these conditions may affect how a cell functions. SCI.B.6 Explain the processes (i.e., mitosis and meiosis) by which new cells are formed from existing cells and how in multicellular organisms groups of cells cooperate to perform essential functions within the organisms. SCI.B.7.4 Explain the process by which a cell copies its DNA and identify factors that can damage DNA and cause changes in its nucleotide sequence. Biology (2000 standards): *The 2000 standards were recently replaced however it is worth mentioning that the 2000 standards for biology included SCI.B1.25 which specifically addressed cancer and uncontrolled cell division. SCI.AP.11 Identify and locate major organs of the lymphatic system and discuss their functions. HW.1.1 Document how personal behaviors can impact health. HW.1.3 Examine how the environment and health are connected. HW.1.5 Formulate ways to prevent or reduce the risk of health problems. HW.2.10 Examine how public health policies and government regulations can influence health promotion and disease prevention. HW.3.2 Utilize resources from school and community that provide valid health information. HW.5.7 Assess the potential success or consequence of health-related decisions. HW.7.3 Model behaviors to reduce health risks. SS.WH.4.10 Trace the origins and developments of the Northern Renaissance* and the Italian Renaissance. Explain Renaissance diffusion throughout Western Europe and its impact on peoples and places associated with western civilization. USH.8.4 Describe developing trends in science and technology and explain how they impact the lives of Americans today. USG.5.11 Give examples of the role that individual citizens can play in world affairs. 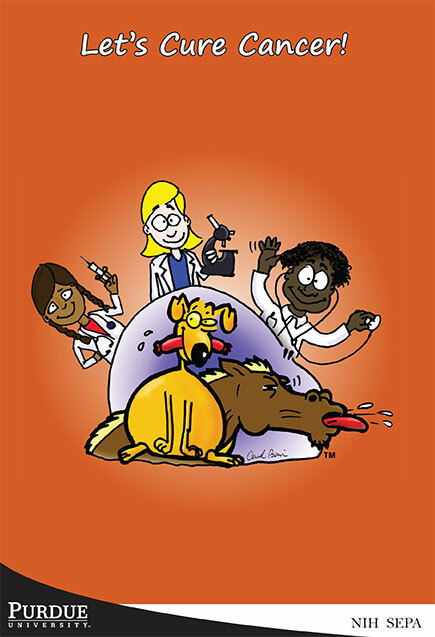 We have a veterinary medicine activity book just for 5th graders. Teachers- The objective of the book is to provide career-based activities for students. This book incorporates Indiana Academic Standards for Math, English/Language Arts, and Science. 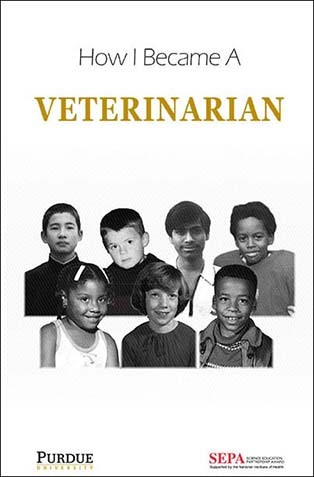 Parents- We hope that your children enjoy the activities in this book, and will consider veterinary medicine as a potential career choice. Kids- We hope that you will have fun learning about caring for animals and the different careers in veterinary medicine.